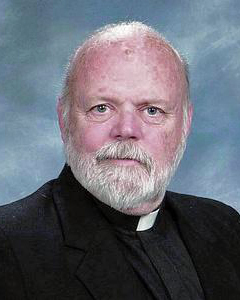 Father Karl A. Zeuner, 74, pastor emeritus of Notre Dame de Lourdes Parish, Swarthmore, died April 14. Born Feb. 4, 1944 in Philadelphia, the son of the late Karl Zeuner and the late Catherine (Mulholland) Zeuner, he attended St. Cyril of Alexandria School, East Lansdowne and Msgr. Bonner High School before entering St. Charles Borromeo Seminary. He completed his studies at the Pontifical Lateran University in Rome where he earned a licentiate in sacred theology. He was ordained Dec. 17, 1971 by Bishop (later Cardinal) James Hickey at St. Peter’s Basilica. His first assignment upon return to the Philadelphia Archdiocese was as parochial vicar at St. John the Evangelist Parish, Morrisville, followed by faculty at Roman Catholic High School. He then served as Newman chaplain for Bryn Mawr, Haverford and Swarthmore Colleges and Drexel University, parochial vicar at St. Charles Borromeo, Drexel Hill, assistant to the Secretary of Clergy and pastor of St. James Parish, Philadelphia, which also had a heavy collegiate congregation. Father Zeuner was named pastor of Notre Dame de Lourdes in 2001 and pastor emeritus in 2014, the year that the parish was merged into Our Lady of Peace, Milmont Park. In retirement he lived at St. Anastasia, Newtown Square. Although he was ordained in late 1971 he was considered a member of the St. Charles Seminary class of 1972 because that’s when the rest of his classmates were ordained in Philadelphia. Although Father Windhaus never recalls Father Zeuner taking a drink other than soda or coffee, “he had a sense of humor and enjoyed a good time. He was a generous and loving man,” he said. Something that was an asset during his years in campus ministry, “he really had a way with young people,” Father Windhaus added. At St. Anastasia, he’ll be sorely missed, according to parish business manager Joseph Lacava. “He was a great sports fan and really knew his stuff, and as a Drexel alumnus I know how much he did for the Newman Clubs,” he said. There will be a viewing for Father Zeuner at St. Anastasia on Thursday, April 19 at 5 p.m. followed by a 7 p.m. Mass celebrated by Father Michael Colagreco. There will be a viewing at Notre Dame de Lourdes Church on Friday, April 20, at 9 a.m. followed by Father Zeuner’s funeral Mass celebrated by Archbishop Charles Chaput. Concelebrants will include Msgr. John Jagodzinski, Msgr. Thomas Mullin, Father Colagreco and Father Windhaus, who will be the homilist. Father Zeuner is survived by his sister, Kathleen Thinnes, and many nieces and nephews. Interment will be at Holy Cross Cemetery, Springfield. Thank you, Mr. Baldwin, for the article on Fr. Z – a truly beautiful soul. He meant the world to us at Notre Dame de Lourdes. His love for the parish of Notre Dame will never leave us, and his spirit will always remain within the walls of our Church.